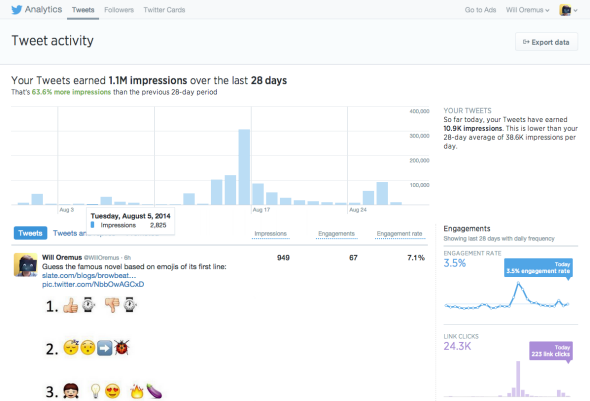 Twitter analytics dashboard: How to find out if people are reading your tweets. Is Anyone Actually Reading Your Tweets? Now You Can Find Out. You worked so hard on that clever tweet. Did anyone actually read it? Until now you could only guess based on the number of favorites or retweets it received. That changed on Wednesday, when Twitter announced that it’s opening a feature to all users that allows you to see exactly how many people viewed and engaged with each of your tweets, along with a demographic breakdown of your followers and several other analytic tools. You can find your own analytics dashboard by clicking here. The default tab lists your tweets in reverse-chronological order and shows you the number of impressions and engagements. In case you’re not familiar with the lingo, “impressions” means the total number of people who saw your tweet in their feeds. “Engagements,” in this case, refers to the total number of times people clicked on your tweet. That includes clicks on your username, clicks to expand the tweet, and clicks on any attached links, in addition to retweets, favorites, and follows. You can also track your impressions and engagements over time. The dashboard also includes a second tab called “followers” that shows you the trajectory of your follower count, as well as the gender, interests, and geographic breakdown of your followers. Click on an individual tweet to see just what kinds of engagements it received. This is the sort of data that Twitter and other social networks have historically made available only to their advertising clients. 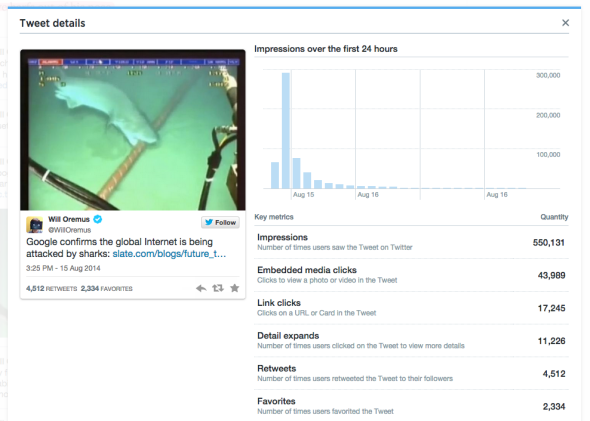 Twitter is among the first to extend its analytics tools to the general public. This feature has been a while in coming: I first reported that Twitter was experimenting with it back in June 2013. For most people, this probably isn’t particularly actionable information. Still, it’s a nice gesture at a time when Facebook continues to take a PR beating for the unfathomable opacity of its news feed algorithms. And it might help to reassure you that there actually are a few people out there reading, even when it feels like you’re tweeting into the void. It could also give you a better idea of what types of tweets resonate with your followers and which ones fall flat. Then you can stop boring the hell out of everyone with stray thoughts that are probably amusing only to you. Or keep doing them! After all, Twitter isn’t a contest, and just because you now have the same tools that are available to advertisers doesn’t mean you have to act like one.